Click Here to Ask An Expert Do you have some questions that you would like to ask a professional dishwasher repairman? Call a few of them and ask if they are a dishwasher repair service, or if they sell parts, or both. Ask them if they offer free advice with the parts they sell (Occasionally, stores that offer both parts and service will not want to give you advice.) Often the parts counter men are ex-technicians who got tired of the pressures of in-home service. They can be your best friends. However, you don't want to badger them with too many questions, so know your basics before you start asking questions. Some parts houses may offer service, too. Be careful! There may be a conflict of interest. They may try to talk you out of even trying to fix your own dishwasher. They'll tell you it's too complicated, then in the same breath "guide" you to their service department. Who are you gonna believe, me or them? Not all service and parts places are this way, however. If you observe such buildup, periodically put about 1/4 to 1/2 cup of "Lime-Away"™ or Citric Acid (usually available at drugstores) in the machine and run it through a wash cycle, with or without dishes. Repeat as often as necessary. If they genuinely try to help you fix it yourself, and you find that you're unable to, they may be the best place to look for service. Here's a hot tip: after what I just said, if they sold you this book, then I'll just about guarantee they're genuinely interested in helping do-it-yourselfers. When you go into the store, have ready the make, model and serial number from the nameplate of the dishwasher. The metal nameplate is usually found inside the door as shown in figure 2-A. It may also be fastened to the top edge of the door itself. If you cannot find the nameplate, check the original papers that came with your dishwasher when it was new. They should contain the model number somewhere. In any case, and especially if you have absolutely NO information about your dishwasher anywhere, make sure you bring your old part to the parts store with you. Sometimes they can match it up by looks or by part number. 1) Use dry (powder) Cascade"™. The real stuff. Do not use liquid detergent. And especially do not use regular liquid dishsoap. 2) Use "Jet-Dry"™ and check it regularly. "Jet-Dry"™ causes water to sheet and run off the dishes, instead of beading up and spotting them. Also use a product called "Glass Magic"™ to assist in preventing filming of the glass surfaces or calcium buildup. obvious on any black plastic parts inside. This is primarily calcium. It can make plastic parts brittle and cause abrasion in moving parts, as well as spotting or filming on the dishes themselves. In extreme cases of hard-water build-up, run 1/2 cup of white vinegar through a single rinse-and-drain cycle, without any dishes in the machine. These are pretty specific product endorsements for me to make without getting paid to make them, don't you think? To be totally honest, there are other chemicals which may be "good enough." But why bother? The "good stuff" only costs a few pennies more, and furthermore, it can be found in just about any grocery store in the nation. See chapter 3 for a more in-depth discussion of wash quality and its factors. Every few months, do a thorough cleaning. Pay special attention to any buildup of detergent around door seals, especially along the bottom edge of the door. Also be on the lookout for cloudy film or calcium buildup. Every six months or so, open the kickplate and check for leaks. Also exercise the hot water shutoff valve under the sink, to make sure it will close when you need it to. Be sure you load the dishwasher properly. Cups, glasses, bowls, etc. should be upside-down so they don't hold water. Large items must be loaded so they do not block the waterjets from the spray arms, or block the spray arms themselves as they rotate. Silverware should be secure. Re-coat or replace any rusty dishracks. You can purchase a paint-on dishwasher rack coating from your appliance parts dealer or local hardware store. Replacing rusty dishracks costs a bit, but a pump leak caused by rusty grit getting into the pump seals can cost you more. This is the most common complaint in a dishwasher. It covers a lot of different specific symptoms, from spotting, film or etching of the dishes to food left on dishes. It is discussed in detail in Chapter 3. First check the house breaker or fuse. The door is interlocked so that no fill or wash can occur while it's open. Check that the door locking lever is fully closed; this will close the door switch. Also check that the door switch is not defective as described in section 6-2(a). Is the motor buzzing as described in section 6-2(c)? If so, the motor is locked up. It may be that something is jamming the pump. It may also be that the pump or motor bearings are bad, or the motor windings are fried; see Chapter 5. 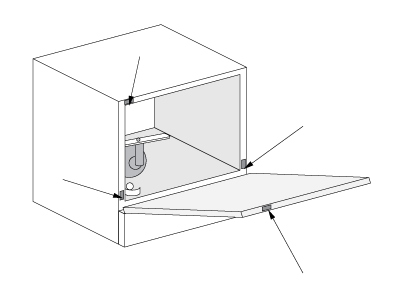 Also check the junction box for burnt terminals; see section 6-2(e). This is usually a defective water valve solenoid or clogged water valve. Try cleaning out the strainer screen as shown in figure 2-B; also test the solenoid for continuity. (Note that some Kitchenaid machines have a dual solenoid valve, with two solenoids. These valves should be tested as if they were two separate valves in series.) Replace the valve if defective. When replacing the fill valve, use an O.E.M. part, or at least make sure the flow control washer is the same as in the original machine. Aftermarket parts may have a different flow control washer, which can cause high or low waterfill in your machine. It could also be caused by the anti-flood float switch being stuck or defective. Rarely, but possibly, it can be traced to a burned contact inside the timer. Test as described in section 6-2 (a) and (b). 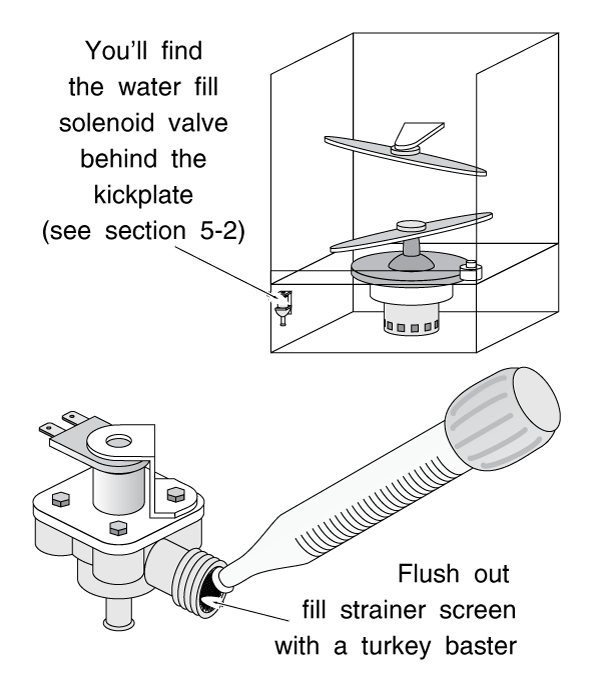 In GE or Kitchenaid machines, the drain valve solenoid may not be operating. 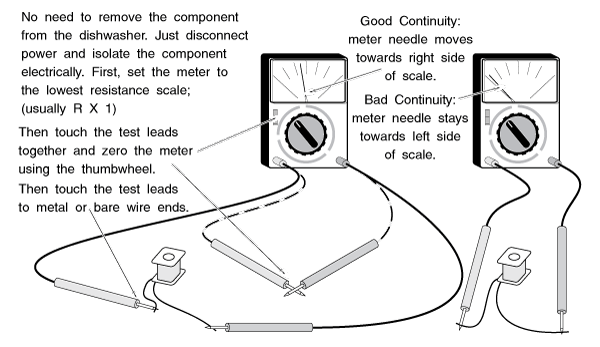 Check the solenoid and also the timer (which controls it) as described in sections 6-2(a) and (b). Another possibility is that junk has gotten into the drain pump impeller, and the vanes are broken clean off. Disassemble the pump as described in Chapter 5 and check the impeller. If you hear the motor trying to start (buzzing and clicking as described in Chapter 6) something is locking it up. It may be jammed with bits of food or glass. It may also be that a starting winding is burnt out. If the machine is direct-reversing and it does start in one direction but not the other, then a starting winding is definitely burnt. Disassemble or remove the pump and motor unit as described in Chapter 5. Clear whatever is jamming it. If you suspect that the motor is bad, check it as described in section 6-2(b). If you don't even hear the motor trying to start, the timer contacts may be burnt out. Test and repair as described in section 6-2(b). There is a also a motor starting relay. If this fails, it will cause similar symptoms. Test as described in section 6-2(c) and replace if defective. Usually it is caused by bits of broken glass or rust getting into the pump impeller or spray arms. It is also frequently caused by worn out bearings in the pump or electric motor. Wasted pump bearings are a notably common problem in Maytag belt-driven machines. Try removing the spray arms and clearing them of debris. This can be difficult, and it may be easier to replace them. Take the pump housing apart as described in Chapter 5 and try turning the pump and motor shafts by hand. It should be smooth, without too much resistance. Any gritty feeling indicates bad bearings or stuff contacting the pump impeller. Usually the timer motor has gone bad. However, be sure to check the wiring diagram first, as described in Chapter 6. There may be several other switches in the circuit, for example thermostat or pushbutton selector switches. The solution is to replace the defective motor or switch. If it's the timer, you may be able to get a rebuilt one to save a few bucks. DIGITAL OR SOLID-STATE TIMERS AND CONTROLS are a whole different animal. See chapter 6. If water is coming out the front of the machine, it's usually leaky door seals, but there are a few other suspects. The wrong soap can cause suds, which can leak out even if the seals are good. There are also some designs which can develop a water jet that blows water past the door seal; this is discussed in Chapter 4. Check for these problems first. If you still suspect the door seal, try cleaning any accumulated detergent or other gunk from it. If you need to replace the seals, your parts dealer has a door seal kit. See Chapter 4 for a more in-depth discussion of these and other possible leak sources. If water is coming from beneath the machine, it is usually coming from pump seals, but it could also be coming from a hose or from the fill or drain solenoid valve. Remove the kickplate and operate the machine while looking beneath it. Try to isolate the leak by watching where the water drips on the floor. Remember that there are live wires under there; don't stick your hands in there while the machine is plugged in. Diagnose and repair as described in chapters 4 or 5. If the detergent dispensers are not popping open, usually a solenoid or bi-metallic trigger has failed. Remove the outer door panel as described in section 5-2 and test as described in section 6-2(f). It may also be that they are gunked up with detergent or rinse agent. Clean them out thoroughly. 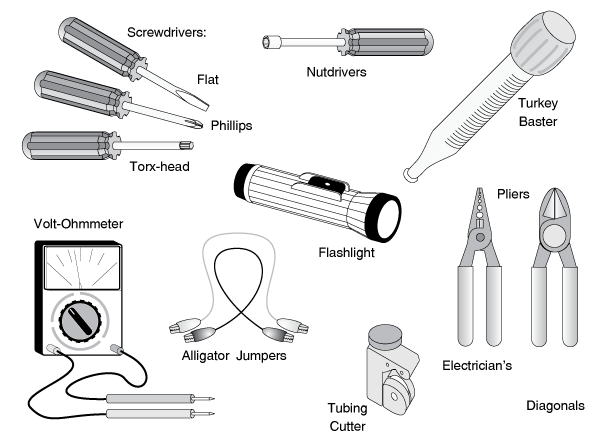 SCREWDRIVERS: Both flat and Phillips head; two or three sizes of each. It's best to have at least a stubby, 4- and 6-inch sizes. For certain late model machines, you will need a size 20 Torx-head screwdriver. NUTDRIVERS: You will need at least 1/4″ and 5/16″ sizes. 4- and 6-inch ones should suffice, but it's better to have a stubby, too. ALLIGATOR JUMPERS (sometimes called a "CHEATER" or "CHEATER WIRE":) Small gauge (14-16 gauge or so) and about 12-18 inches long, for testing electrical circuits. Available at your local electronics store. Cost: a few bucks for 4 or 5 of them. 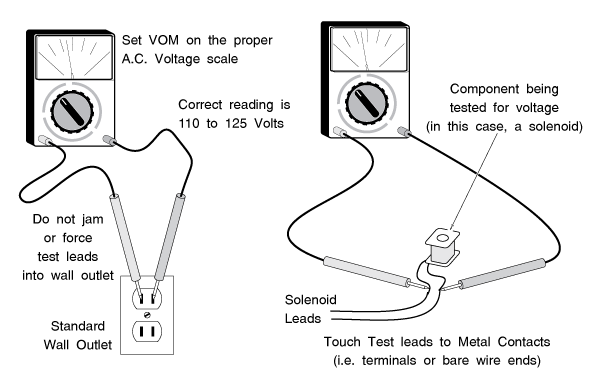 VOM (VOLT-OHM METER): For testing electrical circuits. If you do not have one, get one. An inexpensive one will suffice, as long as it has both "AC Voltage" and "Resistance" (i.e. Rx1, Rx10) settings on the dial. It will do for our purposes. TURKEY BASTER: For flushing out water valves or draining water from pumps. COPPER TUBING CUTTER: If you need to remove the dishwasher from its space under the countertop, you may need to cut the copper water feed line slightly shorter to get a new fitting on when you reinstall the machine. EXTENDIBLE INSPECTION MIRROR: For seeing difficult places beneath the dishwasher and behind panels. Many home handymen are very intimidated by electricity. It's true that diagnosing and repairing electrical circuits requires a bit more care than most operations, due to the danger of getting shocked. But there is no mystery or voodoo about the things we'll be doing. Remember the rule in section 2-6 (1); while you are working on a circuit, energize the circuit only long enough to perform whatever test you're performing, then take the power back off it to perform the repair. You need not be concerned with any theory, like what an ohm is, or what a volt is. You will only need to be able to set the VOM onto the right scale, touch the test leads to the right place and read the meter. That is what the resistance part of your VOM does; it provides a small electrical current (using batteries within the VOM) and measures how fast the current is flowing. For our purposes, it doesn't matter how fast the current is flowing; only that there is current flow. To use your VOM to test continuity, set the dial on (resistance) R x 1, or whatever the lowest setting is. Touch the metal parts of the test leads together and read the meter. It should peg the meter all the way on the right side of the scale, towards "0" on the meter's "resistance" or "ohms" scale. If the meter does not read zero ohms, adjust the thumbwheel on the front of the VOM until it does read zero. If you cannot get the meter to read zero, the battery in the VOM is low; replace it. Ammeters measure the current in amps flowing through a wire. The greater the current that's flowing through a wire, the greater the density of the magnetic field, or flux, it produces around the wire. The ammeter simply measures the density of this flux, and thus the amount of current, flowing through the wire. To determine continuity, for our purposes, we can simply isolate the component that we're testing (so we do not accidentally measure the current going through any other components) and see if there's any current flow. 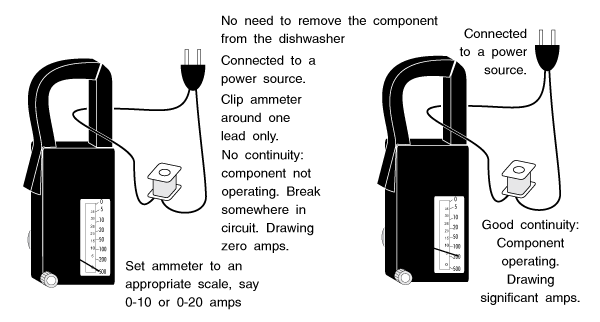 Please share our dishwasher troubleshooting page.